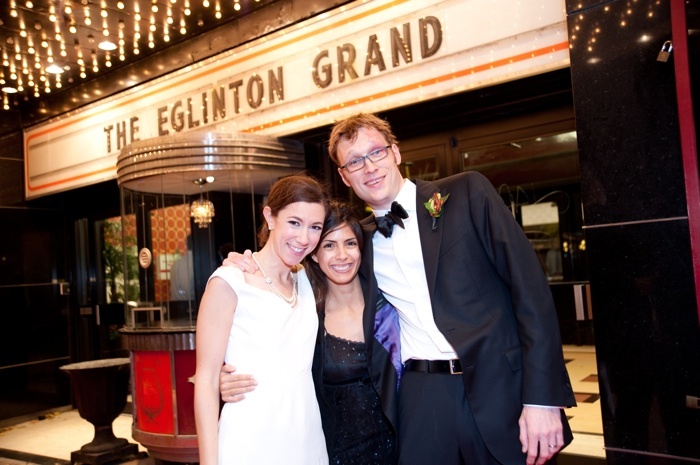 Emily and Paul were married October 31st, 2009 at The Eglinton Grand surrounded by the abundant love of their family and friends. Emily and I went to the same high school and reconnected through The Crane Chandelier Project. Paul, a school teacher and master origami folder, was one of the only people to visit the Crane Booth at The Wedding Show and teach everyone around him how to fold a perfect peace crane. 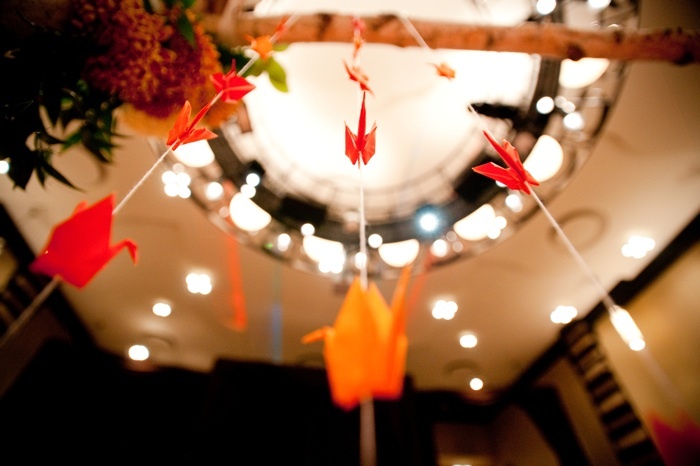 Emily and Paul folded 1,000 cranes for their wedding celebration and then donated them to The Wedding Co’s Crane Chandelier Project. 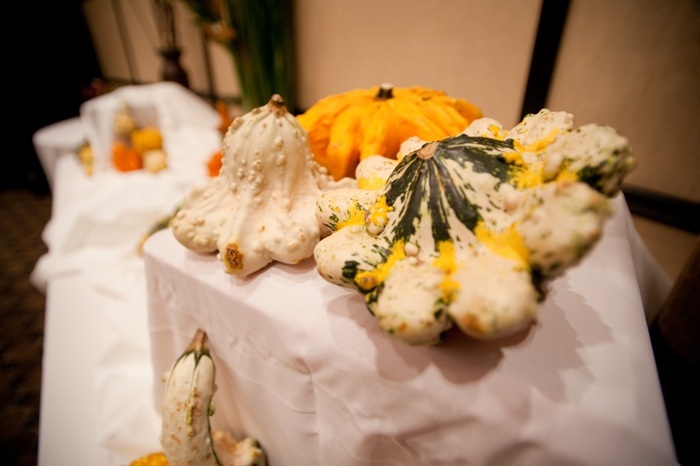 Emily’s mother, Trish, collected gourds and small pumpkins for the autumn theme. 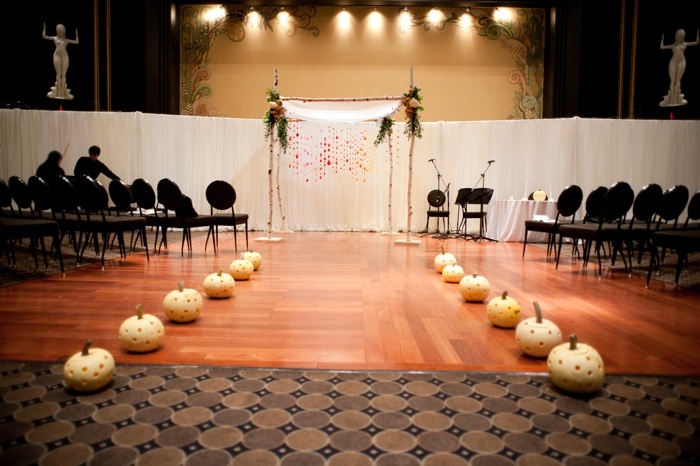 We drilled holes into white pumpkins which lined the aisle for Emily and Paul’s ceremony. All of the table centerpieces were created with love a couple of days before the wedding by a team led by Emily’s mother and they were beautiful! 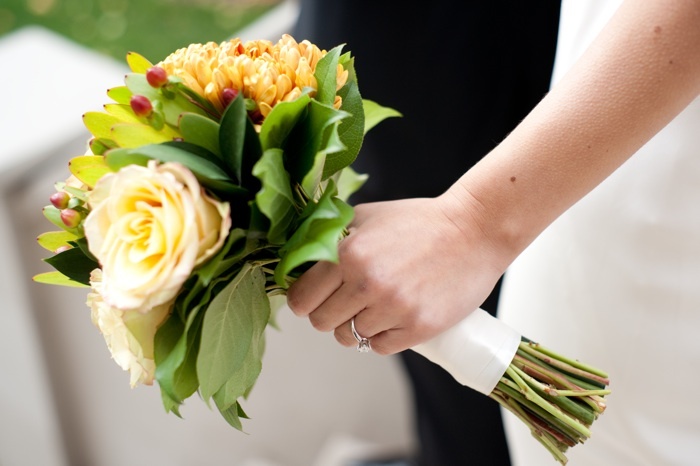 The bouquets and chuppa accents were created by Darrin at Terrain Flowers. 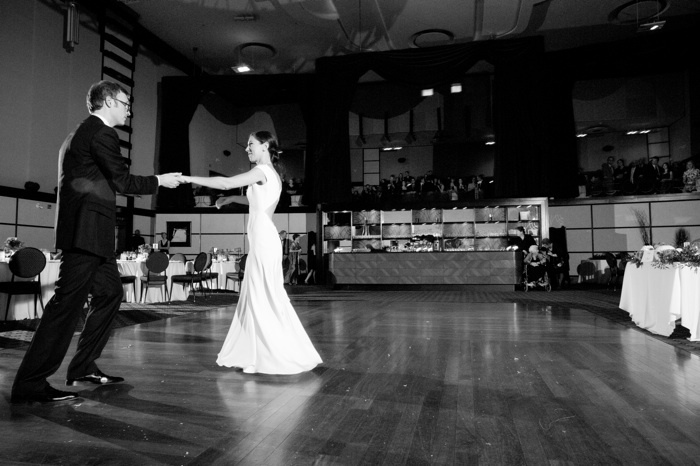 Emily was stunning in an elegant and classy gown from White Toronto. 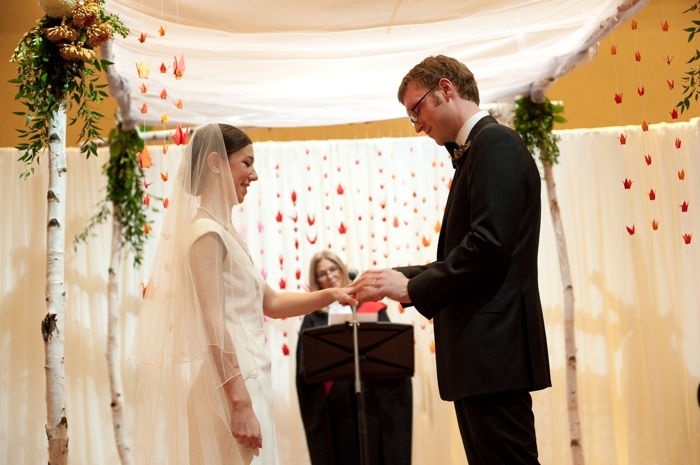 A string ensemble of students from Paul’s school serenaded the guests during the ceremony. What a way to start the party! Emily and Paul were unveiled (literally, the curtains opened to unveil them on the dance floor) for their first dance together. Amazing! One of my all-time favourite moments, Paul is a math/numbers whiz, was when Uncle Earl said he could complete a rubix cube on the spot – he did it in less than 5 minutes!!! It was incredible!!! 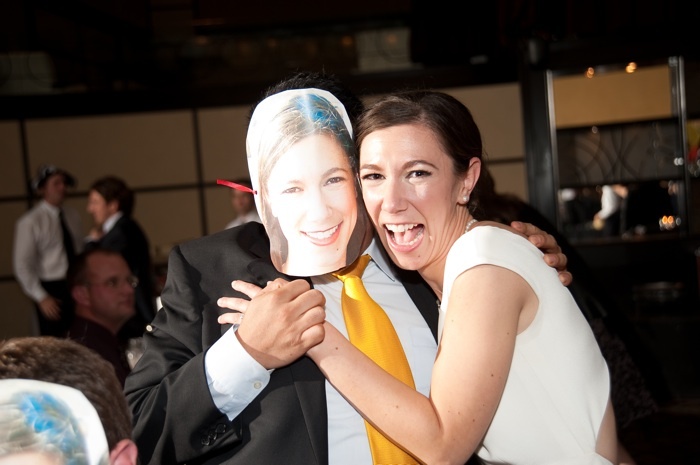 Hallowe’en could not be ignored so later on in the evening, guests had the opportunity to choose masks and fun accessories out of a tickle trunk – looks like someone made some creative face masks of the bride! 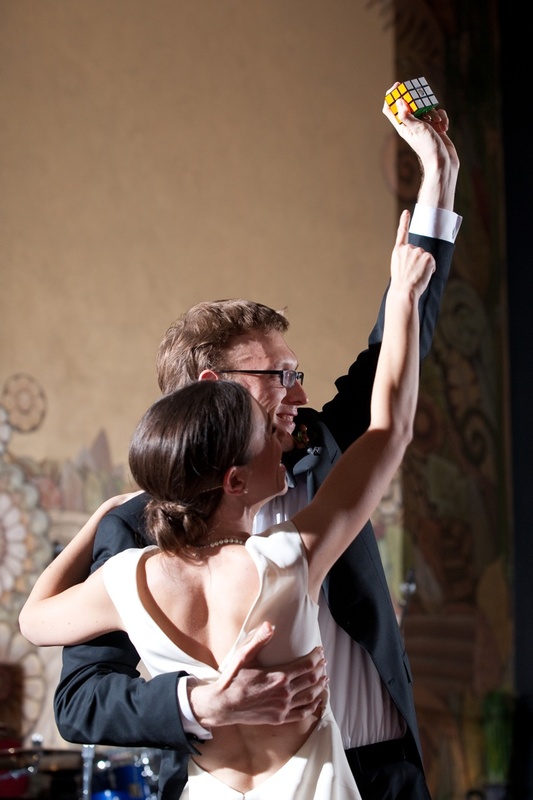 The entire experience with Emily and Paul was refreshing, fun and energetic. It was a true honour to be a part of their special day and this moment in their lives. Happy One Year Anniversary Emily & Paul!! !